While Grandmothers Hills has never been broken, "white settlers" (Ruth’s forebears) who arrived in the early 1900's, put the land into pasture and domestic cattle have grazed it continuously for nearly 100 years. This long period of continuous grazing has put excessive stress on the land. In the last few years we have come to see this land, its native grasses, natural springs and habitat for wildlife, in need of protection and restoration. 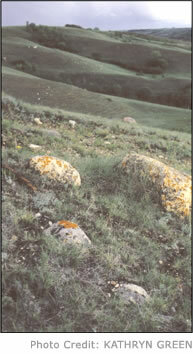 In the spring of 2002 Grandmothers Hills began a period of planned rest. In addition a conservation easement with the (Nature Conservancy of Canada) has been placed on the legal title to protect the land from development and cultivation in perpetuity. Ruth Blaser, (Blaser & Associates) who holds the title to this land has walked this wild prairie since she was a girl, believes this remnant of native prairie is calling to us and that we need to listen. It invites us to make our way lightly, to learn and to practice respectful companionship and connectivity between land and beings including we who are human. In recent years, Ruth is coming to know it as land that holds joy and healing…that holds and respects broken and joyful hearts. Its vastness calls forth imagination and visions. It enables hearts of discernment and embraces hearts of gratitude. But she is also coming to know this land as vulnerable.